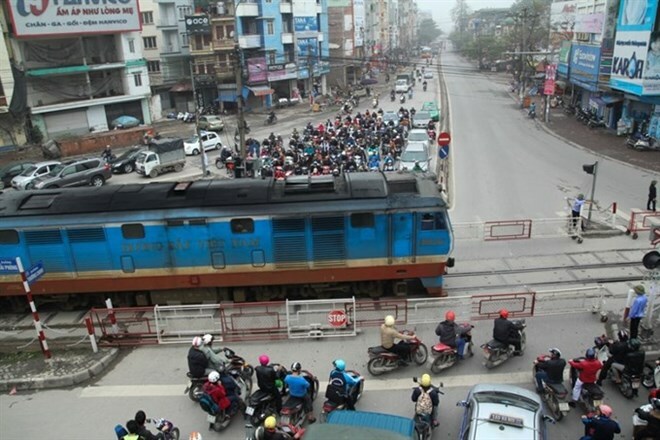 Hanoi (VNA) - The Hanoi Police Department has proposed moving the Hanoi Railway Station and all the inter-provincial rail tracks to the suburbs to avoid traffic congestion and fatal accidents in the inner city. Speaking at the conference on reviewing traffic safety in the first seven months of this year on August 8, Major General Pham Xuan Binh, deputy-director of the department, said that Hanoi was among the five cities left in the world that was using inter-provincial rail tracks with many intersection points in densely populated areas. Currently, there are about 10 kilometres of rail tracks in the inner city, which lead to traffic congestion and pose potential risks of accidents. Thus, it is necessary to move the Hanoi Railway Station and its rail tracks out of the inner city, he said. Binh said it would help eliminate traffic conflicts between railways and roads, ease traffic pressure in the inner city, and reduce accidents. Figures from the city’s Traffic Safety Steering Committee show that in the first seven months of this year, as many as 14 traffic accidents occurred on railroads, leaving 13 dead and a few others injured. Most of the accidents occurred at the intersection points or the crossing of the railways and streets as drivers and pedestrians failed to observe or obey railway signals. Vu Van Vien, Director of the city’s Department of Transport said that rail accidents tend to increase in provinces where illegal crossings are installed. Many crossings were installed temporarily by local residents without warning systems, he added. Binh said from now until the end of this year, the Department of Transport would work with the Vietnam Railway Corporation to build speed bumps at 92 intersection points to ensure the safety of people passing through the area.